March 15, 2019 — Long before she was a UF College of Medicine student, Hanna Peterson would watch live streams of UF Match Day ceremonies, her eyes welling up with tears full of compassion as she witnessed fourth-year medical students take the stage one by one and announce the names and locations of their impending residency programs. This afternoon in the Stephen C. O’Connell Center, Peterson stepped onto that Match Day stage herself. As she approached the podium and opened the envelope containing her residency program information, Peterson’s eyes again filled with tears. But today, her tears symbolized her anticipation and hopes for her own future as an obstetrician-gynecologist, dreams she’s held dear since she was a young teen battling Hodgkin’s lymphoma at UF Health Shands Hospital. The 2019 UF College of Medicine Match Day ceremony saw 121 members of the Class of 2019 successfully match into residency programs across the nation. In his introductory remarks, UF College of Medicine interim dean Joseph A. Tyndall, M.D., M.P.H., told the students how much he related to their pre-Match jitters. 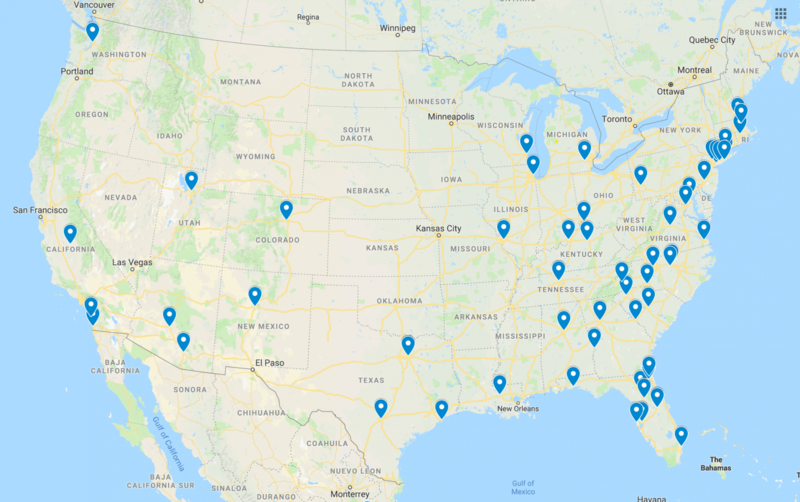 Map of where UF College of Medicine students will complete residencies. UF College of Medicine associate dean for student affairs Patrick Duff, M.D., shared some facts and figures with the crowd of students, faculty, family and friends who comprised the largest audience to ever attend a UF Match Day. 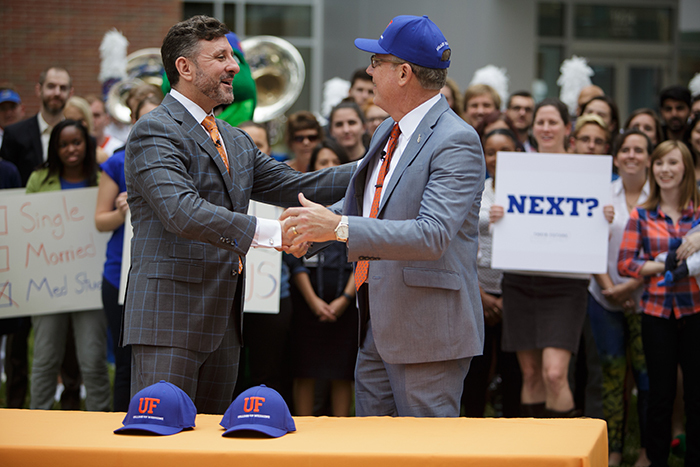 Out of the 121 matched students, 29 percent will remain in Florida, 19 percent will remain at the UF College of Medicine in Gainesville, and 1.7 percent will study at UF Health—Jacksonville. Fourteen matched into family medicine, the largest number of matches in that specialty over the past 19 years. Of the students pursuing the three toughest and most selective specialties, Duff noted, each successfully matched. Two of the students will enter neurological surgery, three will enter dermatology and seven will enter orthopaedics. The UF College of Medicine also welcomes 210 new residents in Gainesville and 85 in Jacksonville who will begin their training in July. Some of the first people Goeto Dantes met were members of the U.S. military. When he was 2 weeks old, his parents fled their native Haiti with the help of the Navy, forced to leave their newborn behind. At age 2, he joined his parents in the U.S. but carried the experiences of his family with him. While at UF for his undergraduate studies, Dantes encountered mentors such as Nikolaus Gravenstein, M.D. ’80, and Saleem Islam, M.D., M.P.H., who helped lead him down a path toward medicine, a field that would allow him to fulfill his desire to help his home country. Now, as he gets ready to begin a surgery residency at Emory University School of Medicine, he aims to one day take what he’s learned and give back to Haiti. During her medical training, Alexis Boulter found a mentor in Joanne Lagmay, M.D., associate professor of pediatric hematology/oncology and director of the pediatric solid tumor program at UF Health Shands Children’s Hospital. From Lagmay, Boulter learned the importance of compassionate care and feels inspired to embark on a career in internal medicine and pediatrics with the eventual goal of working in pediatric hematology/oncology. Boulter’s fascinated by sickle cell transitions of care and adolescent/young adult cancer and hopes to work in both the clinical setting as well as in policy, advocating for the needs of underserved patient populations on a broader scale. For Matthew Booth, the decision to attend medical school was sparked on the other side of the world. At a military camp in Afghanistan, he scrawled his plan of action on a napkin while talking with a fellow soldier, a cardiothoracic surgeon. After spending more than a decade as a fighter pilot in the U.S. Air Force, his experiences seeing trauma and combat overseas ignited his passion for medicine. From studying for the MCAT by the glow of a flashlight at a campsite in the Middle East to settling in for cram sessions with a colony of fruit bats perched overhead at an abandoned command building in Colombia, Booth landed at the UF College of Medicine and now prepares to embark on his next mission: an orthopaedic surgery residency at Washington University/Barnes-Jewish Hospital in St. Louis, Missouri. As president of the UF College of Medicine chapter of the Student Interest Group in Neurology, Aisha Elfasi worked to educate medical students about the rich opportunities available in the field. Through organizing opportunities for her peers like lunchtime talks with faculty, shadowing UF Health physicians and volunteering with national organizations, Elfasi shared her love for neurology with her colleagues and friends. For her own career, she plans to work as a neurologist in academic medicine. “The way we as physicians approach a disease comes from textbook explanations and other people’s experiences, but every patient lives a unique and personal experience of their disease process. As physicians, we should validate their experience and recognize that when we treat a patient, we are treating the sum of all their experiences with their family, environment and other circumstances,” Elfasi says. When facing a difficult situation in the hospital, John Mayfield calls upon the wisdom he gained from years spent working in restaurants and running wine programs as an advanced sommelier in New York and Miami. He says some of the most valuable lessons he learned from his hospitality background are how to resolve conflict, navigate tough scenarios with confidence and establish common ground to find a viable solution. Sometimes, the philosophy of Marriott hotels even pops into his mind: LEARN (Listen, Empathize, Apologize, React, Notify). He will carry these lessons and more with him when he graduates from the UF College of Medicine this spring and moves to Tampa with his wife and child to pursue a radiology residency at University of South Florida Morsani College of Medicine after a preliminary year at Greenville Health System/University of South Carolina. At Miami Children’s Hospital, Elyse Chaviano worked as a physician assistant in the pediatric emergency room from 2013-2015. Today, as a graduating medical student, she looks forward to matching into a pediatric residency, bringing her one step closer to her goals of working with underserved patient populations and teaching the next generation of physicians. As the president and academic chair of the UF College of Medicine class of 2019 and director of the Main Street Equal Access Clinic, Gabriel Daniels feels inspired by the many meaningful interactions he has shared with his peers, mentors and patients over the last four years. Reflecting on each, he is confident the UF College of Medicine has prepared him for success in pediatrics and remains excited to continue serving as an educator and advocate when he becomes a resident. Always searching for the ideal balance between personal and professional happiness, Daniels says he looks forward to starting his “real life” after graduation by marrying his fiancé, Aishwarya Potdar, and continuing his lifelong educational journey toward practicing in pediatric hematology/oncology. “It has been an honor delving into the administrative and curricular roots of the college to advocate for our collective educational success and personal well-being. Our class has constantly humbled me with their intelligence, capacity for compassion and willingness to fight for what they believe, teaching me to wholeheartedly listen to and learn from those amazing people with whom I have the fortune of associating. I will sincerely miss them all as we move into the next phase of our lives,” Daniels says.